Image courtesy Journal of Agrarian Change. This post has been jointly written by the editors of the Journal of Agrarian Change: Liam Campling, Cristóbal Kay, Jens Lerche, and Carlos Oya. 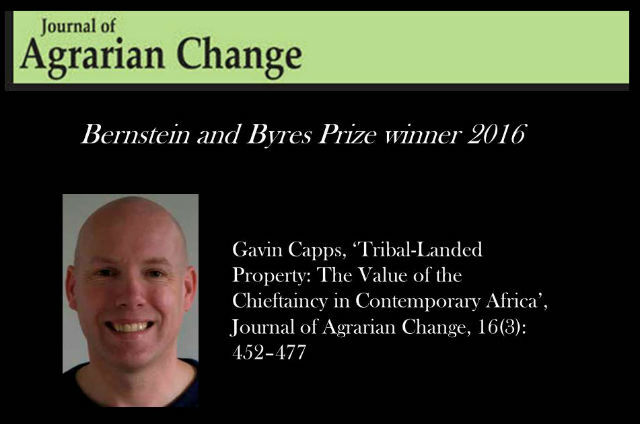 The ‘Bernstein & Byres Prize’ has been awarded since 2008 by the Journal of Agrarian Change (JAC) to the best article published in that year. An award of £500 is given to the winner (donated by our publisher, John Wiley & Sons, Ltd). Articles are judged on: (a) their quality as works of political economy; (b) their analytical power; (c) their originality; and (d) the quality of evidence presented and its deployment. Through this, we hope to reinforce the remit of the Journal in the field of agrarian political economy and to encourage scholarly work investigating the social relations and dynamics of production, property and power in agrarian formations and their processes of change, both historical and contemporary. For the prize for 2016, a jury of four were asked to assess articles shortlisted by the Journal’s editors. Three articles were shortlisted: Gavin Capps, ‘Tribal-Landed Property: The Value of the Chieftaincy in Contemporary Africa’, 16(3): 452–477; Shami Ghosh, ‘Rural Economies and Transitions to Capitalism: Germany and England Compared (c.1200–c.1800)’, 16(2): 255–290; and John Sender, ‘Backward Capitalism in Rural South Africa: Prospects for Accelerating Accumulation in the Eastern Cape’, 16(1): 3–31. The jury consisted of two members of the International Advisory Board (who vary annually) and the Journal’s founders and editors emeriti – Henry Bernstein and Terence J. Byres. The winner is Gavin Capps, Senior Researcher at the Society, Work and Development Institute (SWOP), University of the Witwatersrand. The jury members produced detailed reports for which the editorial team would like to thank them. We draw upon these reports in the following summary of Capps’ ambitious and challenging argument. While his contribution is primarily theoretical, it is one is built in careful relation to a body of empirical work on Africa, including his own on the chieftaincy, customary tenure and platinum mining in South Africa. Capps’ contribution pivots on the founding assumption in African agrarian political economy that, outside of the white settler zones of Southern Africa, ‘processes of commoditization have generated neither large-scale landed property nor generalized dispossession throughout most of Africa’ (Henry Bernstein,‘Rural Land and Land Conflicts in Sub-Saharan Africa’ 2005, p. 67), thus implying a terrain beyond the reach of Marx’s theory of modern landed property and its associated categories of ground-rent. Instead, that terrain – characterized by communal land under the local control of chiefs – is, it is often claimed one that effectively blocks tendencies to rural class differentiation, and pre-empts the emergence of capitalism from above and capitalism from below. Capps argues that this is to be questioned and that the full range of Marx’s categories of political economy may be extended to circumstances where they were previously thought not to apply by virtue of the ‘communal’ – that is, phenomenal – form of land tenure. So it is that Capps’ develops and deploys Marx’s theory of modern landed property as a means of not only analysing ‘tribal landed property’ and the ‘rentier chieftaincy’ as a distinctive social form within the political economy of capitalism, but also of conceptually locating ‘communal’ land relations within the rubric of value relations – a notable lacuna in current debates about the class dynamics of ‘customary’ tenure. Despite its increasing signiﬁcance as an agent of rural transformation, there has to date been remarkably little analysis of the ‘rentier chieftaincy’ in African agrarian political economy. This is Capps’ signal contribution. An explicitly materialist analysis of ‘rentier chieftaincy’ is presented in a complex, but coherent and persuasive presentation where both the colonial and contemporary periods are considered. He is also circumspect, arguing that he has only opened up a line of enquiry and that there is a need for concrete investigation of speciﬁc cases. The third states that the article is ‘very sophisticated indeed, and aims to rethink Marx’s theory of ground rent and capital accumulation, and to show how it applies to Africa in general (South Africa in particular, but plus, in effect, Ghana).’ Capps ‘convinces me that Marx is indeed applicable in this way, to tribal/communal land.’ And the fourth recognised the ‘re-framing [of] the historical colonial conditions of land governance in Africa using a meticulous reading of Marx’s writing on the character of landed property within capitalist economies’ and that Capps’ emergent concept of ‘tribal-landed property’ has ‘profound implications for the “narrative” of land in sub-Saharan Africa’. We would like both to congratulate Capps on his signal achievement and to use this as an opportunity to encourage others to engage in intellectually ambitious and empirically rigorous work in agrarian political economy of this sort; the Journal of Agrarian Change will continue to welcome such submissions. You can also watch a recording of Capps’ lecture on the paper.